There is so much to say about this simple wonder salad. 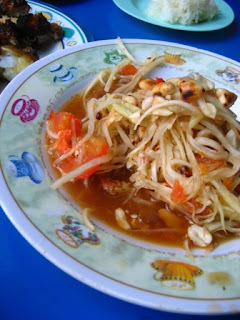 The Isaan region tends to have quite a number of wondrous food and this is definitely the cream of their crop. 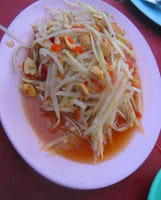 I never know about how good Som Tam can be until I tasted one myself in Thailand. I can eat this everyday as a staple diet if needed. Maybe then I will be as slim as most of the Thai people here. There is just something in their food which a generally slim society even when sugar are consume in excess. 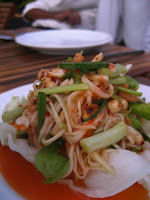 Don’t get me ranting on that, maybe in the next post, now it is all about Som Tam. First, the freshly grated papaya is important. 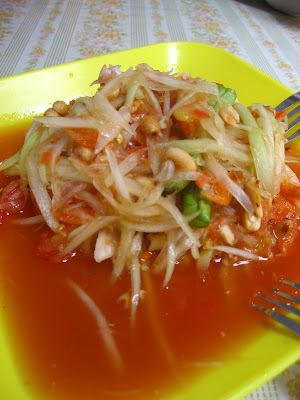 Grated is not exactly the word as I see the Thai chefs skillfully chopped the whole papaya in their hands, and then slice them nicely, where all the papaya falls miraculously into same-sized strips. Believe me, they do it way better than any grater or food processor can ever do. I always stand there in fascination when they prepare it. So maybe if you do it in a machine, it will never be as authentic. Maybe if I’m lucky I can learn up the skill, without losing a few fingers. But first to get hold of these huge green young papayas. Then the important lime juice in the sauce, using Thai rounded green limes that seem to be only found here is an extreme point in the sauce key tanginess. 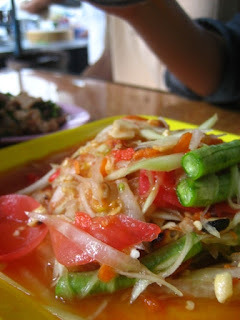 The sauce also uses palm sugar, fish sauce and thai chillies. Plus to me, a Som Tam is never complete without its freshly fried peanuts, where I found is way much better than the varieties in Malaysia. Here they have these not too big and light peanut that they had roasted to perfection. Slight hint of black spot ones are the most fragrant. 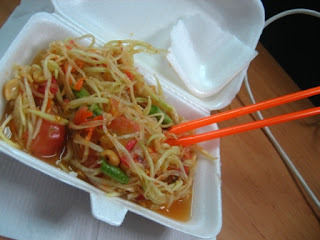 It is also important to have the baby tomatoes, halved added into the Som Tam. 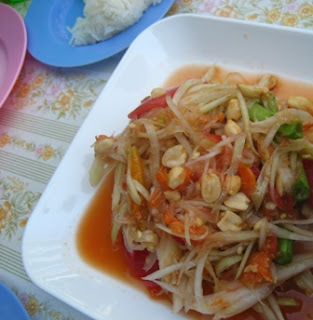 I also usually call the most general version of Som Tam which adds in dried shrimps for taste. Well this one I guess you can get it here in Malaysia, generally we eat with raw cabbages and winged beans, sometimes with basil leaves and spring onions. 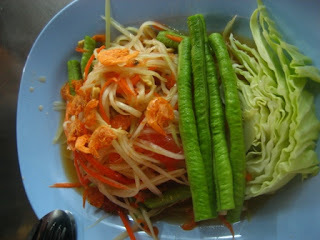 It is really fun eating raw vegetables dipping in som tam sauces. 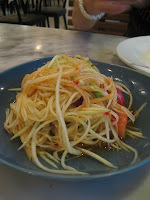 For the love of Som Tam, I must have it every time I am in Bangkok. If I have a choice, I would have it for every meal even. As far as my love for Som Tam goes, I will stuff my mouth with it as much as possible before my chances of having the authentic ones in Bangkok itself ran out. This is definitely one dish I would miss.